How technology moves on. It seems quite recently that playing music from a computer was something for a comparatively few 'geeks', and now, well, it is probably the most common method for the playback of music, whether that be hi-fi, or the playback of MP3. The audiophile has been well served by USB DACs ranging from the ultra budget models on Ebay, to the exotic multi-thousand pound offerings from the high end manufacturers. There are all sorts of accessories, cables, power supplies, and signal enhancers, and of course a wide selection of software that claims to produce better results than standard operating systems such as Windows. I've been privileged to review the likes of Audiophile Linux, JPlay, and Fidelizer, and have tried several of the many offerings based on the various Linux operating systems. It's all left me in no doubt, that optimizing a computer operating system for music playback is worthwhile. A little while back, I was contacted by Dalibor Kasac who was once involved with the development of Audiophile Linux, my preferred system, who told me of a new project called Euphony Audio Transport that took what was good about Audiophile Linux a step further. Apparently to get the very best out of this new software, it is recommended to use a computer with the minimum of an i3 processor, so I initially declined, as both my music computers have earlier processors (Core 2 Duo). However, as nobody else at TNT-Audio appeared interested in reviewing Euphony, I agreed to try it on my computers, even though they are not ideal for this system. Now, one of the things that may put off audiophiles from using these tweaked operating systems (or distros as Linux systems are called) is the effort/difficulty involved in installing them, or getting them to work. As good as Audiophile Linux 3.0 is, it did require some effort (and basic understanding of the Linux operating system) to get it installed and running, despite the best efforts of Marko Lerota to make it as easy as he could. So, before you stop reading, let me state straight way, that Euphony will require minimal effort by the end user to install (or have installed) a new hard drive inside their computer. There will be no need to know how to install any software, as it will come ready-installed on the hard drive. If you can't, or don't want to, install the new drive, any computer shop can do the job for you in a few minutes. There will be three options: a one or two one terabyte, SATA hard drive will come with Euphony already installed, and the user simply installs it in their computer, and then runs the software to copy across their music. At a later date, and for those who already have a large SSD, a USB stick will be made available containing the Euphony operating system. The user's computer is set to boot from USB with that stick plugged in, and the Euphony operating system is installed on the existing SSD. For the present, the Euphony SSD drives will be SATA format. As the better M.2 connection motherboards become more popular, M.2 SSD drives will be offered. Installing a drive into a computer is really a matter of plug and play, and in my experience for those who don't want to open their computers up to install a drive, there are many who will undertake the job for a small fee. Certainly your local computer shop will be able to do this very simple (while you wait) job if you can't. Actually, there will be another option! 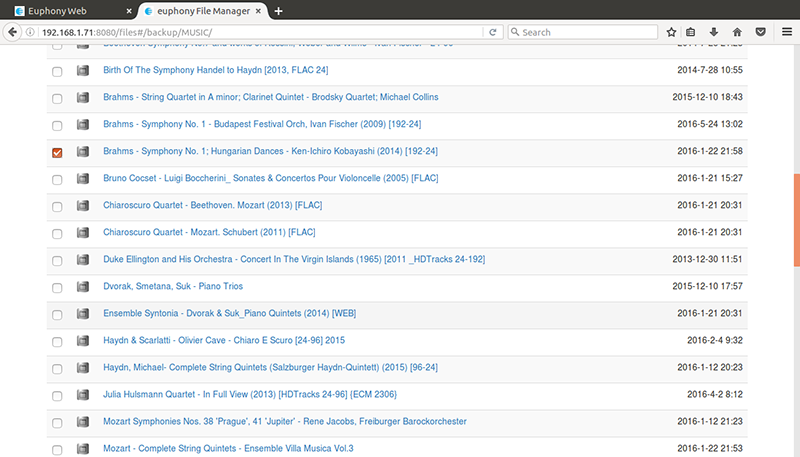 It will be possible to buy a music server (from Matrix-Audio) with Euphony already installed. That, of course will be the easiest option, and particularly attractive if the user doesn't already have a dedicated computer for music playback. Euphony will boot from the 'new' hard drive, and the computer will become a headless (ie it doesn't use the monitor or keyboard and mouse) music server/player. You control the playback of your music either using a mobile phone or tablet, or another computer that is connected to the music playback computer via a network (Ethernet) cable (not wi-fi as that would degrade the sound quality). There is one job to do before you can play back music, and that is to copy your music files from where ever they are, onto the Euphony SSD, but that is a simple matter of plugging the external drive (containing your music) into the computer, and then using the built in file manager to copy the music across to the SSD on that computer. This really must be the easiest method of achieving real audiophile quality computer playback on your own computer. 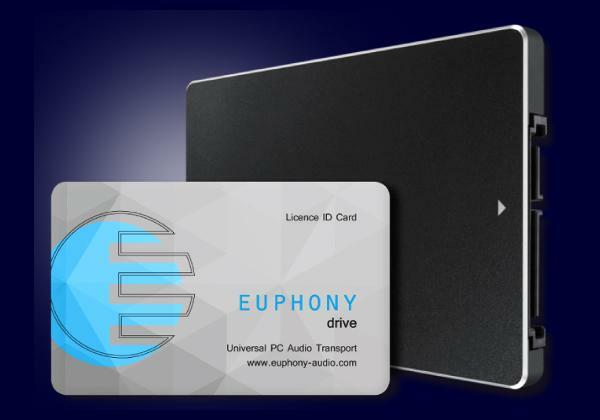 Euphony plays back the music from the solid state hard drive because that is claimed to improve sound quality over playing it back from a spinning drive. But isn't Euphony just another piece of software that claims to sound better than all the others? And is it really worth spending money on this type of software anyway? Well, consider that you may well have spent a great deal of money on your USB DAC, perhaps up to 5k, and that you want it to perform at its best. Let's use the analogy of buying one of the best turntables 40 years ago, and then using it with a very cheap phono stage. It's the same with the DAC, it can be the best DAC on the market, but if it doesn't receive the best signal from the computer, it will be compromised. This is what I wrote about 'standard' operating systems plying music in my review of Fidelizer. But even something such as JPlay has to work on a computer carrying out the rest of its (routine) tasks. If you are not a computer geek, you may wonder what these tasks are. One example is that it has to constantly check to see if the user has issued it with any commands via the keyboard or mouse. It also has to keep on constant guard for improper use of the system by a potential hacker or virus. It has to keep an eye on its file system. It accomplishes all those tasks, and many more, by using 'interrupts'. In other words it interrupts one task to attend to another. And it can do that without us hardly noticing anything because it does everything so quickly. So, that's how everything is being accomplished in the computer, by being constantly interrupted and, when we play the music back, the computer is not giving its full attention to that job. Like a human being trying to do several jobs at once, it is not doing any one job to the best of its abilities. A good read of hi-fi forums will reveal that some audiophiles have very expensive USB DACs, and then use them with a computer that must carry out those many other tasks while it is supplying a music signal to the DAC. The Raspberry Pi is a very good budget solution for computer audio, and often used with expensive DACs, but can't compete with a dedicated (more powerful) computer running a dedicated operating system. Euphony is designed to play music optimally, and do nothing else. Everything currently possible has been done to lower the latency to under 10 milliseconds, and its developers have found no other system that comes close. It's worth repeating, that Euphony is designed from the start to play music optimally. It is not a system that was designed for something else and has been tweaked to make it better for playing music. That's what gives it its advantage. A word about computers to use with Euphony. The guys at Audiokernel tell me that the Euphony Drive will work well with any PC, but using an i3 (or better) processor will produce better results. The sound quality will depend on the usual factors such as the amount of RAM installed in the computer, with 4 GB being the suggested minimum. I should stress again that I auditioned Euphony with an older computer using a Core 2 Duo CPU, and 4 GB of RAM, and it sounded awesome, but the software is so good that the results are reflected by better hardware. That, of course, applies to any operating system used for music playback. 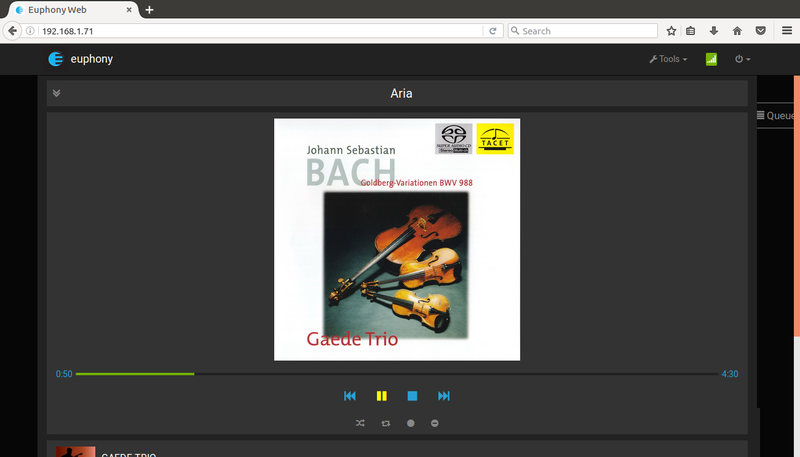 Euphony will work on any modern PC. 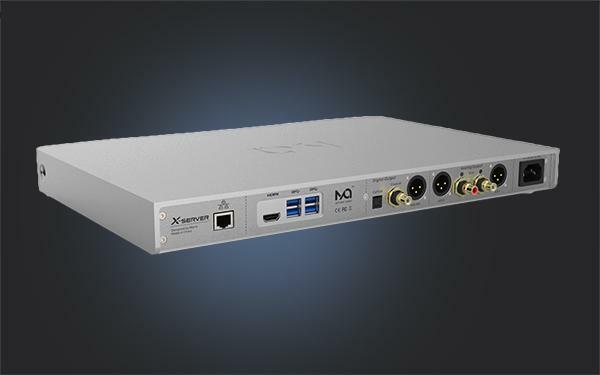 The Matrix-Audio X-Server, designed for use with Euphony Transport. 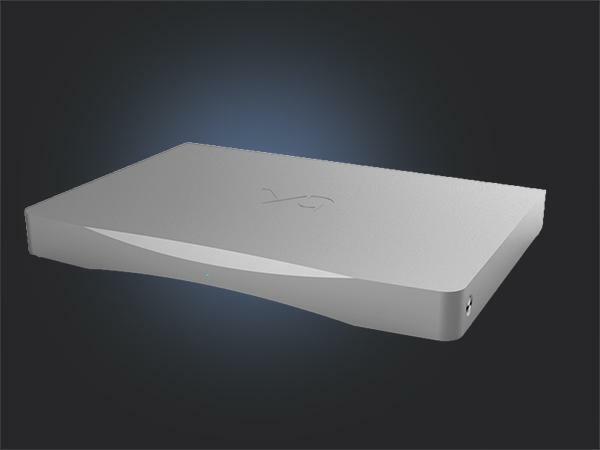 There will also be an audio server, called the X-Server from hi-fi company Matrix Audio. The X-Server will be a top specification audio server incorporating the Euphony Audio Transport operating system licensed from Audiokernel. Two versions will be offered, one with, and the other without an internal DAC. The DAC will be built around the latest Sabre ES9028PRO DAC chip. The Matrix Audio X-Server, designed for use with Euphony Transport. So, how does Euphony work, and more importantly, how does it sound. I've found Euphony very easy to use. It's as intuitive as almost any computer application can be, and really, once you have your music library set up, playing back your desired tracks could hardly be easier. The GUI (graphics user interface) is well thought out, clean, modern looking, and a joy to use. Euphony finds album covers and artwork (with a single click), and presents it all very aesthetically. It also includes a built in PDF reader so that you can not only see the album artwork, but also read any included sleeve notes too. I used a laptop to control Euphony, simply typing the address of the Euphony computer into a browser, and I was instantly connected. 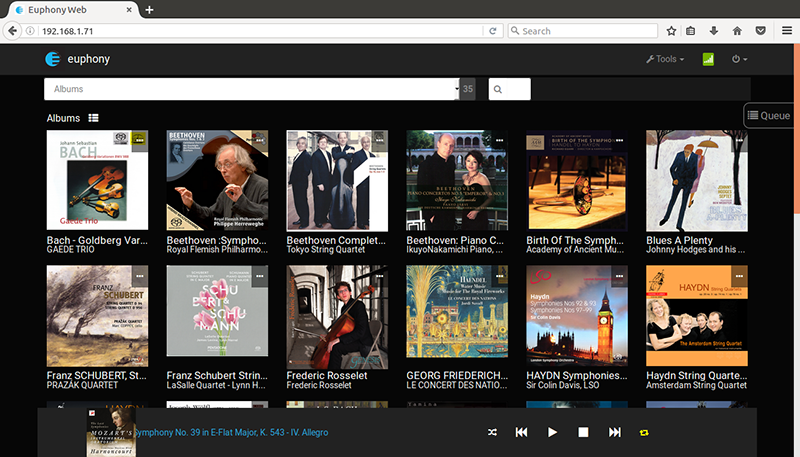 I then had a choice to use the browser window to select the music to be played, or to use something like the excellent music player, Cantata. The GUI for Euphony is optimised for use with something like a mobile phone or tablet, but after a while, I found that it was equally easy to use in Firefox browser on a laptop. An android app is available to put on the users mobile phone or tablet that will (remotely) control Euphony from that device. For customers who want to have a dedicated tablet PC for control of Euphony, there is a special version of Euphony Remote, available on request, that wipes off all other apps on the tablet and turns it into real Euphony Remote. Audiokernel supply Euphony with a credit card sized registration card that has a QR code printed on it. Scanning the code with a Smart Phone will connect the user to Euphony without the need to even type a single character! Roon server is now incorporated into Euphony, and any Roon licensed user can use a Roon Remote on a tablet and enjoy full Roon functionality. The same goes for Sqeezelight and other HQ players. Audiokernel have said that they will probably add a JRiver option "very soon". MPD remains as a default player. The point is that all those music services will be able to perform much better than on a "bureau" operating system (Windows, iOS) or even on standard Linux builds. It's very difficult to directly compare music operating systems because it is almost impossible to have them both running side by side to do an A-B comparison. But, I will say that in my opinion, (and even running on a less than optimal computer) that the sound that I got through Euphony was the best that I have heard to date. The music was very natural (the most natural that I have heard, and most noticeable with acoustic instruments) and fluid, as well have being extremely detailed. I would go so far to say that this is the most analogue sound that I have heard from a digital source, ever! While auditioning Euphony, I had the excellent iFi iDAC2 here for review, and using that, I was able to play any format of music file that I found without problem. Listening to some of the high resolution DSD tracks through Euphony really showed how superior they are to standard recordings. And keep in mind that my computers are apparently not optimal for getting the very best out of Euphony. Like many products that we purchase today (I'm talking about those that have firmware), it is inevitable that there will be improvements made to Euphony as time passes. Conscious of the fact that a majority of audiophiles are not computer experts (and don't want to be), the designers of Euphony wanted to avoid asking their customers to download and install the system each time there was a minor update. So they have written special software that will allow the user to simply click on an 'upgrade' link in the settings panel of the interface, and the whole process of downloading the update, and installing it, will be carried out with no further input from the user. So, at last, software engineers who realise that not all of us have the ability to, or want to, spend time trying to get something to work on our computer. I updated several times during my review of Euphony, and everything went smoothly. It will depend on the Internet connection involved, but with mine tested at 18 MBS, each upgrade was downloaded, installed and ready to use in under 15 minutes. All in all, I am highly impressed by Euphony. It sounds so good that there is no doubt about the improvement that it makes, and that's even more obvious with higher resolution files, and better produced albums. It's easy to use, looks good, offers a choice of user control from another computer, whether that is a desktop, laptop, or tablet, or a mobile phone, and in my experience there is absolutely no problem in making the connection. If you have been put off trying something better than your standard operating system by the fear of having to make complex changes to your computer, then Euphony Audio Transport is just what you need. I haven't looked at all the competition to Euphony, but it is hard to imagine that there is something better out there. Just a reminder if you are looking at the purchase price of Euphony, and thinking that it is expensive. The purchase price includes the cost of the high quality SSD that is approximately 60% of the price. Updates are included in the purchase price, and you shouldn't need to buy any more storage for your music collection. Initially, Euphony will only be available from the USA, but negotiations are already under way to find European distributors.